This pop-up is one recent example of thousands of variations of scareware that permeate the Internet. In this case, a customer clicked on a link to what he thought was information on the death of Prince. 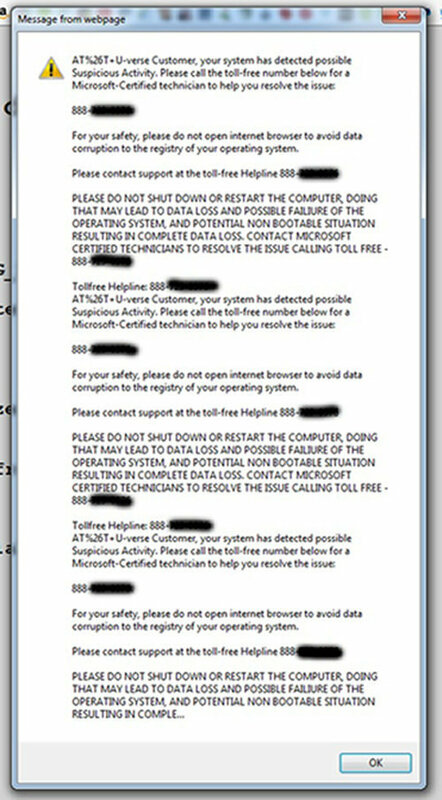 As soon as he clicked on it, the screenshot shown to the left popped up telling him his computer was infected and that he needed to call the provided 800 number so a “Microsoft technician” could “fix” his computer. Fortunately, he didn’t call the bogus number. These pop-up pages vary and appear to be authentic as they sometimes include things like the name of your Internet Service Provider, IP address, official looking seals, loud sounds, etc… There is always a toll free number for the victim to call. In the example I provided, they listed their phone number ten times. If you make the mistake of calling these criminals, they try to persuade you to let them take control of your PC remotely. Once you do, they can install a backdoor into your computer so they can log into your PC anytime they want. They have access to all of your files, and often in addition to the hundreds of dollars they try to get you to pay them for “fixing” your computer, they try to steal your identity or passwords to your email and banking information. Some of the time, you can get rid of the pop-up by holding down the control, Alt, and delete keys simultaneously. Then click on “task manager” and end all tasks showing up there. Also clear your cookies and browsing history.